Photo: The Office of the President of Nigeria. President Muhammadu Buhari has said it is a “dream come true” to commission the first phase of a light rail network in Nigeria’s capital city. Known as the Abuja Metro, the 45km line was built by China Civil Engineering and Construction Corporation with the help of Chinese investment and president Buhari was quick to praise the country’s support of the project. He said: “Let me place on record the Nigerian government’s appreciation to the government of China and the EXIM Bank of China for their support on this and many other projects currently being executed in the country. In his commissioning speech, president Buhari alluded to the fact the current rolling stock could only provide “skeletal services”. However, he said that negotiations had recently taken place in China and that agreements were signed for the procurement of the main rolling stock needed to operate a full service. 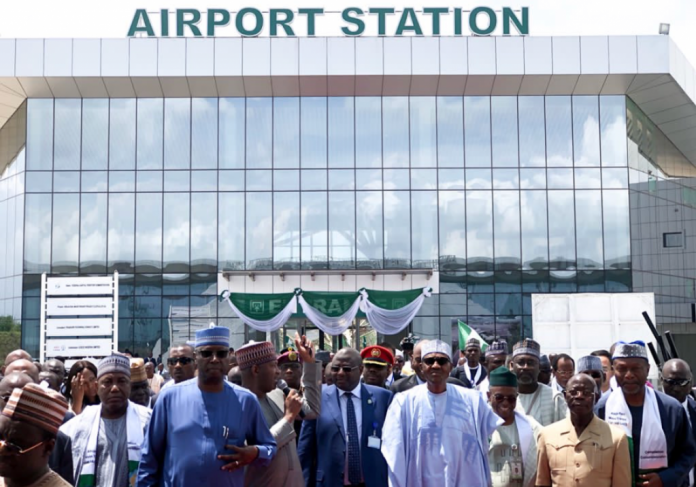 In addition, Buhari described transportation as “the live wire of any city” and said the system, which connects the airport and national rail network, will boost the economy of the wider Federal Capital Territory area around Abuja. After commissioning the system, president Buhari toured Idu station, where he was shown around the metro’s control centre, and Airport station (Pictured).